Not all airports are created equal, and anyone that spends time in them learns this lesson quickly. While some airports are simply transit points, more and more are positioning themselves as destinations themselves. 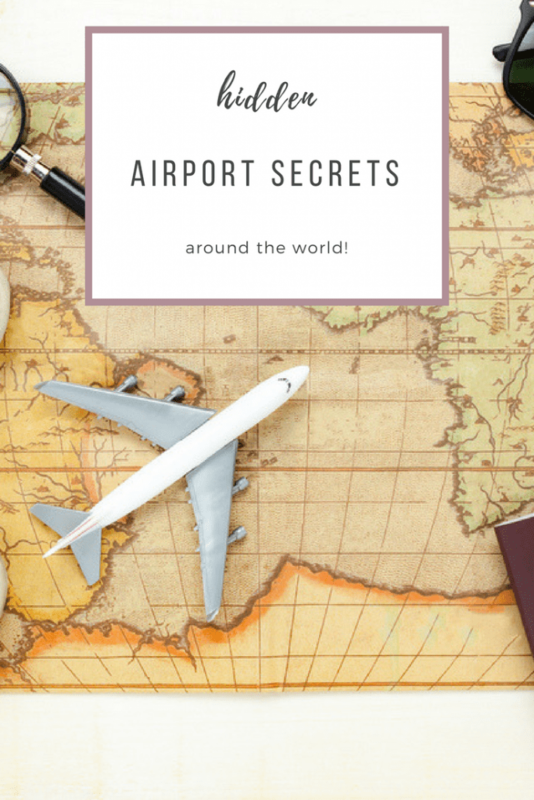 Not everyone loves an airport but with the help of some other travelers I’ve put together this list of airport secrets (and some not so secrets) about a wide variety of places around the world. If you have a favorite tip not listed, please leave it in the comments! On the second floor there is a prayer room/area. They also have an area that is full of chaise lounges to relax in during long layovers. Near the D gates there is a green rest area that has chairs and beanbags. If you’re in need of more of a rest the Yotel is a fantastic spot to get a few hours sleep. I used to think of layovers in Atlanta, GA as a pain, trying to get across that huge airport in time for my next flight, crowded in with everyone else on the shuttle between terminals. But if you’ve got more than 30 minutes between flights, take the scenic route instead. Walking between terminals in ATL is surprisingly relaxing and provides a much needed respite from sitting and being around other people. The hallways between the shuttle stops are always crowd free and are beautifully done with murals, posters, and other artwork spanning the gamut from Civil Rights history to natural bayou, complete with soundtrack. It’s about a 15-30 minute walk, depending on where your going, and is my favorite thing about the seven hour flight between Florida and California. Bali is a paradise with beautiful beaches, amazing culture and delicious food. But when it comes to internet connection, it is a nightmare. Even the local operators can’t offer a 3G or 4G service in the whole island, and if you are not staying in a luxurious resort your best option for good and fast wifi is Bali’s airport. Gusti Ngurah Rai Airport, mostly known as Denpasar Airport, it has one of the fastest internet in the island and is the one of the best places to get your online work done. If you need to upload those beautiful photos from the trip or share a nice video, go a few hours before your flight and enjoy the free wifi. Bear in mind that food inside the airport is quite expensive, so if you are going to the airport hours before your flight bring along some snacks. Even if you are not flying you can connect at the Arrival Hall of the International terminal, if you are in need of good wifi, it’s worth to try. My best hidden secret is in the Bangkok airport. Ever had a long layover where you desperately need to sleep? You’ll find the moving sidewalks that go upwards, but if you look just beneath them, there is a ton of place to sleep. Choose your spot far away from the main hub of the airport, and you can get a good night’s sleep (albeit on hard ground) without noise, and no one to wake you up early – sleep in as long as you want! After spending few days exploring Barcelona, you will definitely be exhausted from walking. Nevertheless, just before boarding your plane at the El Prat Airport in Barcelona, you will find a fantastic surprise to relax your body. At Terminal 1 a few express mini-Spas were opened recently for travelers. The Spas are located in Boarding Area C, D & U and they’re a great place to treat your body with Indian and oriental therapies, and enjoy a bit of luxury before boarding your flight. Inside O’hare you’ll find a great kids “airplane playground.” You’ll also want to treat yourself to some of the best popcorn in the country at Garretts – order the Chicago blend. Look for the vegetable/herb garden; the aeroponic garden is in Terminal 3 over the G concourse. There’s a lounge area nearby that you can enjoy a meal and relax in a green, serene environment! Doha is really a transit airport but they have put in lots of art and lighting installations which can be quite mesmerizing! In the airport in Doha you can use a 25 metre temperature-controlled indoor swimming pool and a spa for about $40. I recently had a 8 hour layover and I really enjoyed the facilities. Dubai airport has a gym (G-Force Gym) that’s really affordable. It has a pool and sauna and is much needed on long flights like those between the UK to New Zealand. Grab a FREE shower in Terminal 1 between Gates C18 and C22 or Terminal 3 between B13 and B19. I’m not sure if other airports have this, but I’ve never seen one like this. There are two viewing platforms on the top floors at Dusseldorf airport. There’s a small fee to go, but it’s a nice place to have a picnic. There’s also family days once a month or so with free activities for kids. If you’re traveling with a pet then you’ll love this feature. The Dog Hotel. 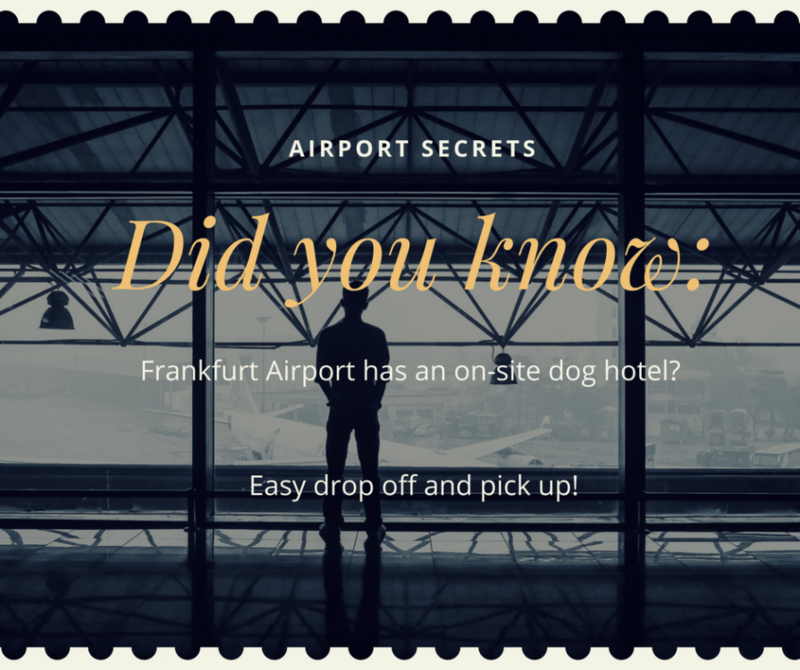 Don’t worry about finding someone to watch your pup while you’re away, drop them at the airport pet hotel and pick them up when you return. There are also great play places for kids scattered across the Frankfurt airport, especially the spaceship-looking playground in Terminal 2. At London Heathrow if you have kids they have a great free playplace in Terminal 5 near Gate 4! It is ideal for kids 7 and under or so. They even give free socks! My boys 5 and 3 enjoyed playing there for over and hour while we killed some time during a layover! Was great to let them run and play before our next flight! Incheon Airport has a free shower on the fourth floor if you’re transferring, with a free shower kit. There are also free showers in the east and west wings, but you do have to pay a small fee (about $1) for the shower kit. Open from 7am to around 9:30pm with a 30 minute time limit. The convenience in Korea still amazes me. Check out the cultural center at the airport which has Korean crafts and activities for kids (or adults) to try! There’s a container hotel in Kuala Lumpur’s airport, so you can sleep in a shipping container turned private room complete with privacy shade and electrical outlets, towel rental, toiletries, and access to the shower for only about $20 USD! Perfect for catching that early morning AirAsia flight. Visit the used bookstore at the Milwaukee airport and also be on the watch for the the signs that say “recombobulation zone” to make you smile! Ahead of security you’ll find ping pong tables for people waiting to board or for arrivals. “Jaya He” is an open museum at Terminal 2 (T2) of Mumbai’s Chhatrapati Shivaji International Airport. The artwork on the walls of the terminal has more than than 5,500 objects and 134 art installations representing India’s cultural legacy and traditions. Some of the artefacts date back to as old as 11th century. The paintings and the artworks are a combined effort of both renowned artists and lesser known artists from all over India. Germany’s Munich Airport has its very own brewpub and open-air beer garden with heater lamps! When I flew home after attending the Oktoberfest, I was able to enjoy one last good-bye Pilsner at Airbrau–the worlds’ first and only airport brewery. Did you know that Munich airport is home to the only airport brewery? Yes, you read that correctly! Munich airport is home to Airbräu which has been brewing beer with master brewers on site since 1999. Airbräu is perfectly located in between terminals 1 & 2 within the open air space. There’s even a beer garden to enjoy when the sun comes out during the day and it is a popular spot to enjoy a freshly brewed beer between a layover. Did you know that Airbräu also has the most affordable beer prices in all of Munich? Currently priced at €2.75 you can pick up yourself a pint of this wonderfully crafted, unfilterted Bavarian beer. The food at Airbrau is also based on a traditional Bavarian menu which is also not to be missed. I can recommend the beer flavoured Goulash or the pork knuckle which goes perfectly with the freshly brewed beer. Also, during the Lent period Airbrau serves a special beer called “Aviator”, which has a 8,9 percent alcohol level. it’s so strong it could easily makes you fly away before you make it to the departure gate. If water is more your drink of choice, don’t waste your money buying bottled water here. Munich has some of the cleanest and best tap water in Europe – just fill up a reusable bottle instead. Salt Lake City airport does free shuttle tours to Temple Square on layovers as short as two hours. Many airports do these for 4+ hours, but this is the most time-friendly service (and it’s free!) I’ve seen. Plus Temple Square is gorgeous. If you have a long layover in Singapore’s Changi airport, you can find lie-flat chairs in every terminal that are free to use. These are the perfect place to rest your head if you need to get some shut-eye, and are much more comfortable than your average airport chair. Many of these areas are surrounded by beautiful indoor greenery, too! Check out the airport maps to find these free lounges where you can rest and relax. Changi Airport in Singapore has a butterfly garden, the only one in an airport, most people don’t know about it but it’s pretty nice. It is in terminal 3 and it has 1,000 butterflies! St. Denis airport on the Reunion Island, the boarding hall has a glass floor, through which you can see your beloved ones who accompanied you the the departures hall. The Toronto airport has a GoodLife Fitness Gym. It’s around $15 for a day pass and they will rent you work out clothes and sneakers. Plus, they have showers for after the workout! 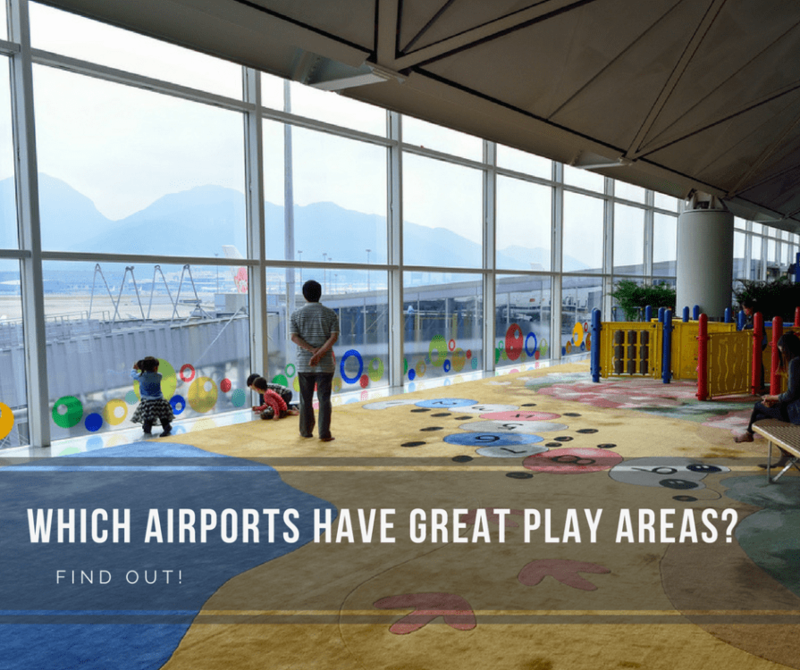 At Zurich Airport there’s a family room that has places to play and relax. It also has a kitchen so you can heat up something to eat. Have a long layover? 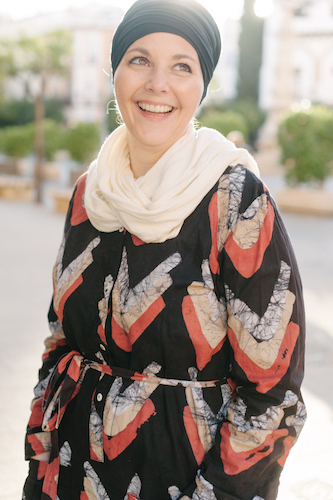 Read some of the great ideas (including free city tours) in this post from Luxe Adventure Traveler. Phone battery always dying at the airport? We totally get you! 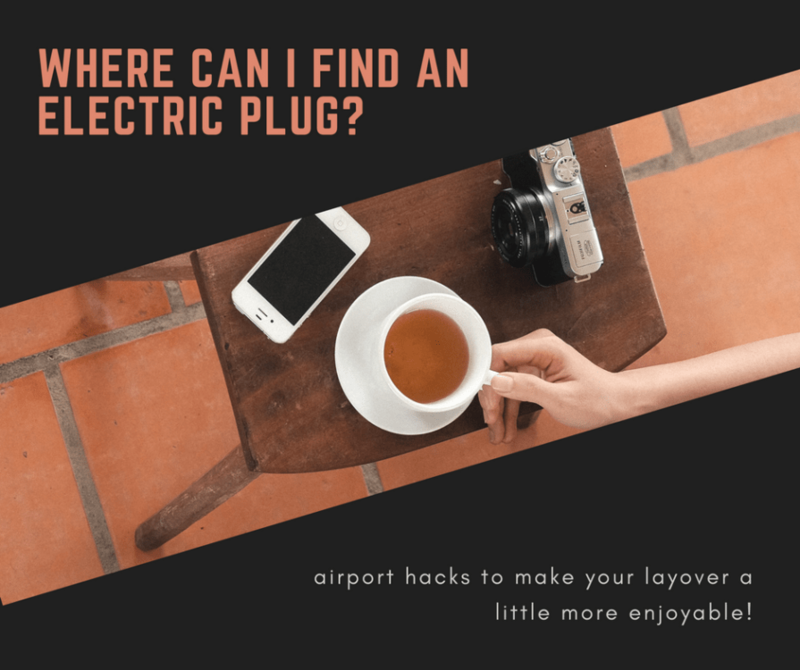 Instead of fighting other travelers for the coveted plugs, simply keeping an eye out can reveal seemingly hidden outlets! Helpful hint: keep an eye out for maintenance workers! Power outlets are typically scattered in patterns, especially if they’re branded or sponsored. Find the pattern, find an outlet. Truthfully, finding power at airports hasn’t been as difficult or tedious as people make it out to be. If you want to be prepared (or that moment’s hero), ensure your power strip is in your carry-on. Halifax Airport just opened a store called Liquid Assets in the departure lounge. Plenty of Nova Scotian beers, wines, and spirits for that last minute gift (or to get past the insane prices of booze on your flight). It’s near gate 20. Istanbul’s airport requires receiving an SMS code on your phone to access wi-fi. This bites, because most non-Europeans will have a plan that allows roaming. Instead, ask someone else sitting in the lounge if they have a local phone number that could receive a message for you. Mine is a general tip. Many Asian international terminals have a spa/massage parlour within the airport. Kuala Lumpur, KLIA1, has a reflexology and wellness centre. KLIA2 has Thai massage services onsite. If you’re on a budget, there are massage chairs EVERYWHERE!! Walk a few steps and you’ll find the ‘Rest & Go’ stations as they’re throughout the Airport. So, for a few dollars you can get a decent chair massage for up to an hour. Is it worth buying a lounge pass? If you’re not quite a top tier traveler yet but want to enjoy the convenience and comfort of using an airport lounge you can buy an entrance pass in many cases. My favorite service to use for this is Priority Pass. You can purchase different membership levels depending on how often you travel and use it in 1000+ of airports across the world. I love this membership and have saved so much money not needing to buy food and having a place to relax in between flights. In some airports the lounges are open 24 hours which is ideal if you have an overnight layover or late arrival. See if it’s right for you and if you decide you want to try it you can get a discount! Great tips! 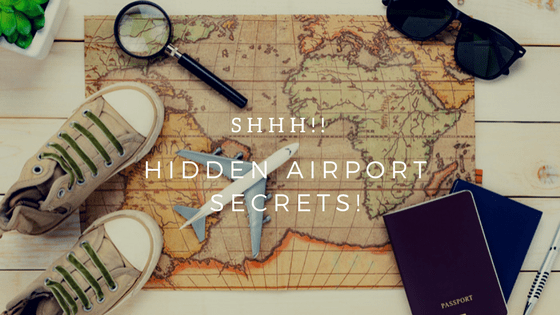 Gonna bookmark this post, so next trip we can check the airport secrets to the places we are flying to or that we’ll have a layover.